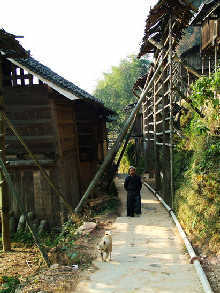 Biasha is a Miao village only seven kilometers away from Congjiang County, Guizhou Province. The 2,140 villagers are more like a tribe and seldom have contact with the outside world. They lead a self-sufficient life in the hilly areas. Biasha is a place where ancient culture has been completely protected. Through hundreds of years, Biasha men have been guarding their homeland. A strong sense of precaution inherited from Biasha ancestors keeps them isolated from the outside world and has helped them maintain a primitive slash-and-burn lifestyle. Even young children wear sickles on their waists.Biasha might be the only village authorized by the government to keep guns. Though not tall or strong, Biasha men are extremely confident in their traditional clothes. The color is a special bluish purple. Biasha people usually add egg whites into the indigo when dying the coarse cloth, making it shiny and waterproof. Decorated with old-fashioned and colorful embroideries and supplemented with the charm of silver chaplets and bracelets, the clothes of Biasha women wear are uniquely beautiful. Even little boys understand the hair bun is a symbol of being a man, as well as an emblem of power. Boys have to take part in a shaving ceremony between the ages of seven and 15. 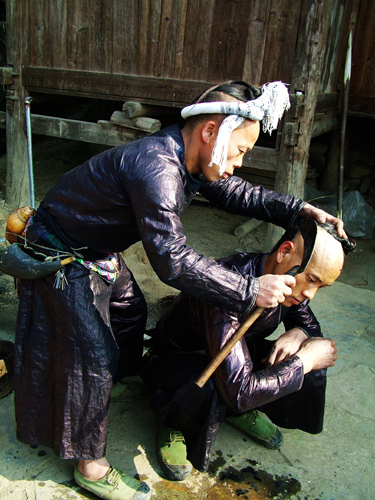 The tribe leader wets a sickle with the water used to boil eggs, and shaves off all of the boy's hair except for the central part, which is coiled into a bun. Boys are given a hunting rifle at the age of 15 as a sign that they've become adults.